Being in Berlin was like going back and forward in time at the same time. Amidst buildings that represented every age of Berlin’s history, the impact of what had passed there was tangible. On one side of the street historic beautiful facades stand the test of time, forever impressing on-lookers, and on the other side of the street industrial blocks of concrete that stand tall and impersonal to remind us that we are certainly in another era and no longer in pre-war Europe. With this picture it is made clear that Berlin is a direct reflection of its history- acting as a reminder of all that has come to pass here and all that will continue to grow. Esthetically bearing its soul, as if to say “we know this is kind of ugly, haphazard, and maybe even messy, but life is kind of ugly, haphazard, and maybe even messy.” Berlin has seen hard times and prosperous times, both they are recognizing with grace. With the emphasis for fully feeling the weight of its history at every turn it is difficult to focus one’s attention, but for this I will turn mine to the Holocaust memorial, the Jewish Museum, and The Topography of Terror. From all angles we were able to receive a range of emotions and perspectives, allowing us to connect with the impasses of present day Berlin. The Holocaust Memorial was our first stop, which really threw us right into the deep end. It was designed by the American Architect Peter Eisenman. The simplistic and almost not beautiful design of the memorial is striking with its varying levels of concrete rectangles, resembling graves, starting low on the outside and growing taller as you walk toward the center. The ground below you sinks down simultaneously as the concrete rectangle slabs start to rise overhead. We felt inescapable feelings of drowning amongst familiar surroundings that once seemed manageable. However, where once we could see all around us, now we couldn't see and we were quite literally in over our heads. You feel isolated from the outside world and alone. A maze pattern is formed by the cold rectangles, leading you to search for those you came with or perhaps to hide from them, as many school children seemed to be doing around us. Whether the artist intended it or not (which I will assume that he did), the memorial itself seemed to mimic what I imagine might have been the sentiments of the Jews during the Holocaust, scared, alone, isolated, in over their heads, no longer able to see the world around them, loosing friends and loved ones, searching for friends and loved ones, and hiding from the Nazi’s persecution, execution and torture. As you can image we certainly felt the power behind the memorial and we eager to learn and feel more. 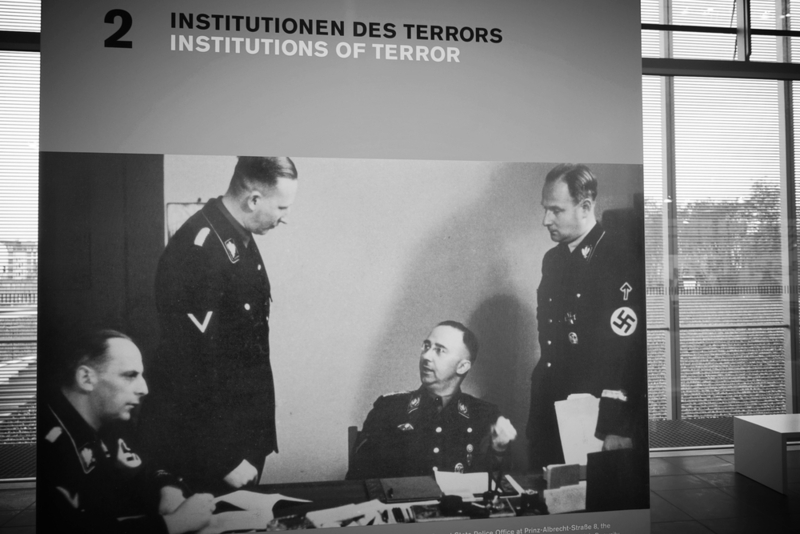 To follow this experience with the Topography of Terror catapulted us from strong feelings of victimization to feelings of anger and resentment. The Topography of Terror is located at the original location of the Nazi headquarters. Tension surrounds the area and almost chokes out the air as you approach the sterile building with jagged rocks, bunkers, and barbed wire around the perimeter. If you ever wanted a full lesson in Nazi history, the regime, and those who governed it, this would be it. As I metaphorically met the leaders of the regime and recounted the events of each year that progressed in this unspeakable time in history, I could hardly come to terms with how any human could have acted so inhumanely and with such hate, fear, and malice. How any community, society, group, or individual could come to loose all love and all morals seems unfathomable, but moreover, how do we ensure that history does not continue to repeat itself. How do we as individuals, but even more as communities not allow for the strength of a dictator become the voice of a nation? To not allow this voice to drown out the voice of humanism, compassion, and forward thinking. Not allow the weight of reparations or bad times to suffocate wisdom. Let us not loose site of questioning, of development, and of responsibility. Let us empower and be empowered to do better. Let us remind each other of the truths we hold self-evident. We find ourselves reminded of these truths in Libeskind’s curated experience at the Jewish museum. His immersive art is transcendent of time and space and taps into our deepest human emotions of isolation, fear, freedom, memory, loss, love, living and death. Reminding us all of what connects us: the commonality of the human experience and emotion. Libeskind’s ability to infer emotions through our interaction with his design is remarkable. What Libeskind makes additional clear is that what we feel is perhaps one billionth of the range of emotions of the victims that endured what we now face through history and ourselves. Libeskind’s partnership with Menashe Kadishman to present the exhibition of “Fallen Leaves” is breath taking. 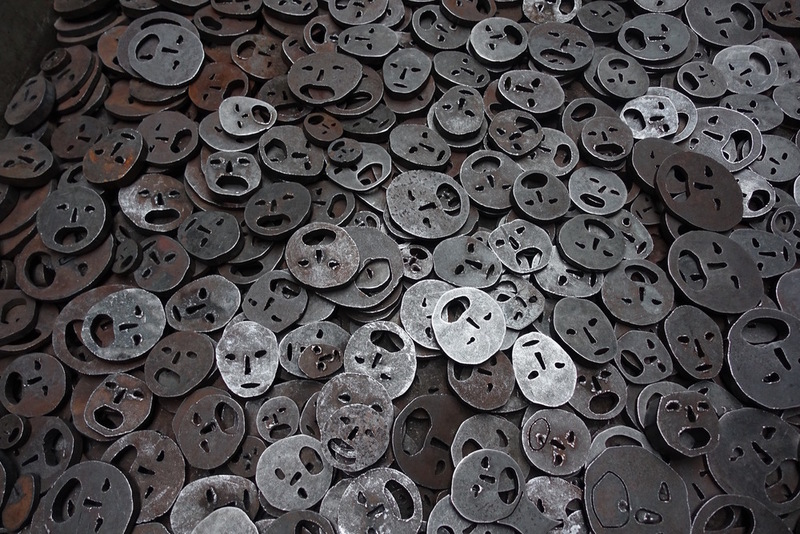 As you walk into the open void stepping over 10,000 iron faces clanging on the ground, you are forced to listen to the metaphorical cries of the innocent victims of the Holocaust, calling on our memory and its relationship with past, present and future- almost imploring all who trod over these faces to recollect the past but also to recognize the victims of the future, like a call to action to not let history repeat itself. Hearts heavy, we call on ourselves to never forget and live for the future. Even though we reflect upon Berlin’s history as devastating and oppressive, and even now our experiences of reflection have been downcast; it is because of this history that Berlin finds strength in its many identities and in continuing to develop these identities from learning from its mistakes, just as we can learn from our own mistakes and the mistakes of others. It is in this history that movements of strength and power have risen out of the rubble and into a sociocultural place of revolution and expression. Where we know the voice of the next generation will rise up and face the history of tomorrow.